Everyone wants to be the next Dollar Shave Club ad. Aside from being a fantastic and effective ad, it’s a perfect example of viral marketing, with almost 24.5 million views and counting. Unfortunately, most of us can barely agree on what classes as “viral” content, let alone create it at will with a set marketing process. Worse still, much of the existing research on viral marketing ignores one key factor; how big your audience is. That’s like gambling without even knowing how much you’re betting – the theory is solid, but you can’t expect to succeed without knowing more. Data is worthless if you don’t know the limitations of it, and so first you need to know what the data set I used was, and what the problems with it were. First up, the method. There’s no set description for how you measure whether content is viral, but seeing as most of us consider viral content to be those seen by millions upon millions of people, I judged the engagement (shares, likes, etc) content received on social media to be the prime factor. 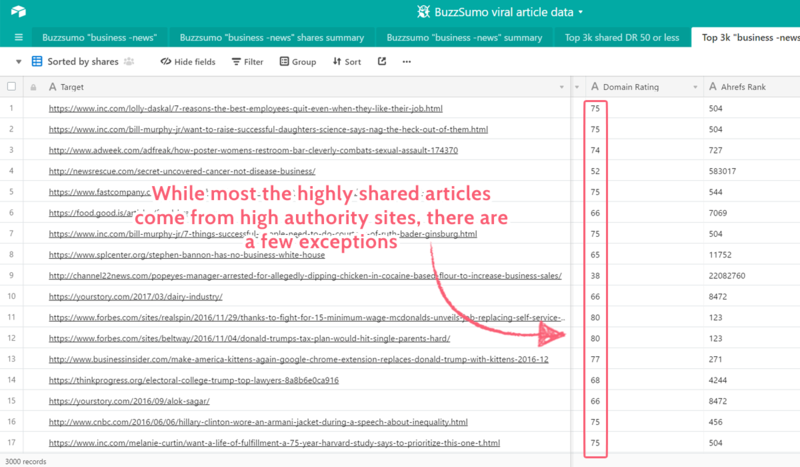 Therefore, I found these articles by searching Buzzsumo for the most shared articles in the past year. Since you can’t search without a core topic, term or website, I went for “business”. After the first round of results I noticed that the vast majority of the results were news-related, and so I stuck “-news” onto the search term to remove whatever I could. The resulting CSV export totaled 10,879 articles, videos, and pages in general, which I then arranged into an Airtable base to make it easier to sort. The biggest potential problem here is that we’re using BuzzSumo data, which only gathers data from Facebook, Twitter, Google+, LinkedIn, and Pinterest. Instagram and Snapchat both have sizable user bases which are highly engaged with the platform, but BuzzSumo doesn’t provide data for either of these sites, and so any conclusions should be taken with a pinch of salt concerning content on there. There are a few other points which could compromise the findings, but all of these will be brought up along with the points they affect. Essentially, the specifics may not be entirely accurate for your own content, but the trends found (most of which are supported by other research on the topic) are applicable to your own techniques and are worth testing out yourself. This shouldn’t come as a surprise, but sites which were well-established had a much easier time going viral than newer ones. Well-known websites are more likely to be revisited, bookmarked, subscribed to and/or trusted by their readers, all of which boost the number of shares they receive. Having a set metric for how well-established a website is, however, was difficult. Although there isn’t a set scale, a fairly reliable method is to look at a site’s domain rating in Ahrefs, which is exactly what I did. Domain rating is a value from 0 – 100 and is technically a summary of a website’s backlink profile, but it’s also a pretty good indicator of how long a site has been around, how well known it is, and how popular it is (since all of those are more likely to net them backlinks from bigger sites, thus boosting the DR). So, with that as my metric, I took a rating of 50 or less to mean that a site was “not established”. In the top 3,000 most shared articles from last year only 146 came from the lower bracket, leaving a massive 2,854 which came from well-established sites. In other words, having a good enough following and backlink profile to be above 50 domain rating, made a page 19.5 times as likely to go viral. Again, this makes sense, since having a dedicated audience means audiences are more likely to share your content and actively engage with it, and in turn share it with others who will also be interested. It’s not impossible to do so without an existing following, but it is far more difficult. Social media management can be a nightmare, especially if you’re just starting out. Rather than putting the time and resources behind testing the various platforms and seeing which will best suit your campaign, it’d be much easier to know which will give you the biggest bang for your buck and focus on that. Now, it’s worth noting that the gap between the number of shares on the various platforms wasn’t actually so big. Buzzsumo counts Facebook “engagement” rather than purely shares, meaning that those figures actually compare the number of shares on other social media platforms with Facebook shares, likes and reactions (potentially even comments too). There was also a slight variation in the best performing social media platform. Although the top 20 most shared articles last year all got the largest portion of their engagement from Facebook, the 21st gained more shares from LinkedIn. Finally, once again, Snapchat and Instagram were not included in this data since Buzzsumo cannot collect that data, so the share distribution may be skewed on that front. Despite this, engagement is engagement, and if you’re really strapped for resources then it’s worth considering (with some prior testing) focusing on Facebook, as this showed to be the most prolific platform for gaining shares. Remember, however, that we’re talking about viral marketing here – once your content starts to get noticed it should get recommended to more people through shares and breaking into their filter bubble. If you can build a following on these platforms you’ll likely gain the initial kick your content needs to start getting noticed. In other words, just sharing your content on Facebook isn’t enough. It pays to have at least a small initial audience to give yourself the best possible chance of getting noticed. Again, while considering the data set’s caveats, the average share count per article was much higher among content that surpassed 3,000 words. This is probably because longer content tends to be more comprehensive and useful. Therefore it is also usually more worthwhile to share and, in turn, more useful to those who see it, and so on. Not only that, but news pieces (and time-sensitive content in general) tends to be shorter, therefore making longer articles more evergreen. Evergreen content will get more attention over time, therefore nabbing more consistent share counts. However, as mentioned above, there are one or two caveats. 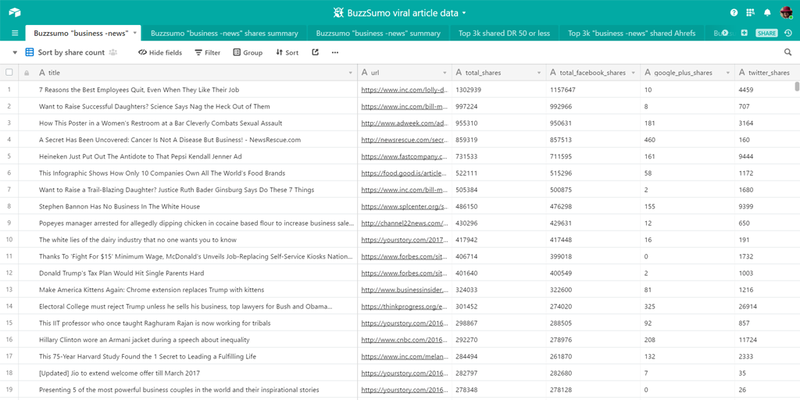 First up, at the lower end of the word count scale, Buzzsumo appeared to get many results incorrect. Hell, 12 articles were counted as having a word count of zero, despite very much having content on their pages. The articles with the highest word counts seemed to be more accurate, although with all results it’s worth remembering that comments are counted in the word count (if they are shown as default). In short, don’t take it as gospel, but combined with evidence gathered by sources more scientific than I, if you’re looking to get as many shares as possible and have a successful viral marketing campaign, go for as long of a word count as you can without waffling on. You could make the argument that going viral and getting vast numbers of shares is bound to net you a few backlinks. If that happened your post might start ranking for decent keywords and bring in regular organic traffic. In this data set, that didn’t happen. Shares alone are not your miracle cure to build a blog. The top 10 most shared articles of last year got a whopping 7,208,208 shares across social media and engagements on Facebook. The total number of backlinks for them is 8,943 and their total organic traffic is 8,076 (according to Ahrefs). 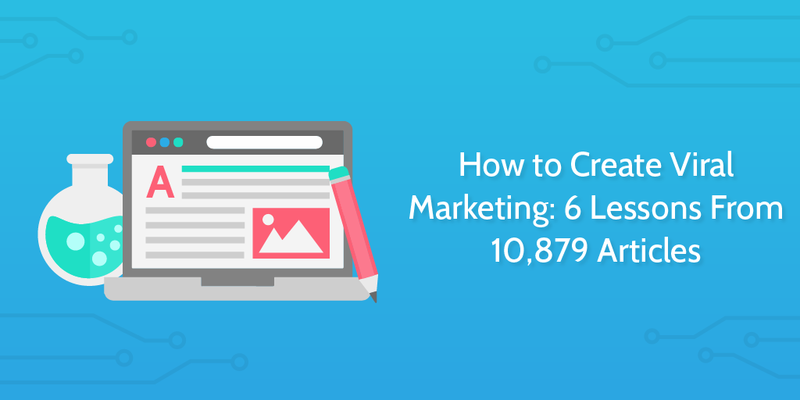 On average, each article got 720,821 shares, but only 894 backlinks and 808 organic traffic per month. While that might sound like a lot, remember that these are the top 10 most shared articles last year. If we were to compare that same return rate to, say, the average share count of a 3,000+ word article, you’d be getting 23 backlinks and 21 organic traffic per month. In other words, if you’re looking to use viral marketing to generate long-term traffic or success for your site, you’re better off investing in a solid SEO strategy and spending your time building a backlink profile. It’s less glamorous, but viral marketing isn’t about traffic – it’s about spreading the word and letting people know you exist. While it was 19.5 times as likely for established sites to produce viral content, all hope is not lost – there is much to be learned from the exceptions to the rule. After all, advice like “get popular” is useful to no-one. Yes, everyone in their right mind hates it, but spam content somehow managed to consistently worm its way into the top 3,000 shared “business” articles last year. Gems like Sparttan use comically typical spam articles to (I assume) gain views for ad revenue or serve as easily replaceable cloaks for Facebook ad campaigns. At least, I can’t think of another reason why the Facebook engagement was high enough to hit the “most shared” list. In all honesty, I was originally going to skip mentioning them altogether. What the hell can we learn from spam when we’re trying to go viral in a way that won’t just damage our brand? Well, unfortunately, there were only 13 pages in the top 3,000 which came from sites with a domain rating of 10 or less (as in, they are brand new, have next to no backlinks, or have been flagged as spam sites). Five of those pages are no longer active (so probably Facebook ad proxies), and four were spam. In other words, the largest portion of low power domains that got shares last year were useless. It’s tempting to write this off, but with these being such a large portion of the results, there are a couple of valuable lessons here. 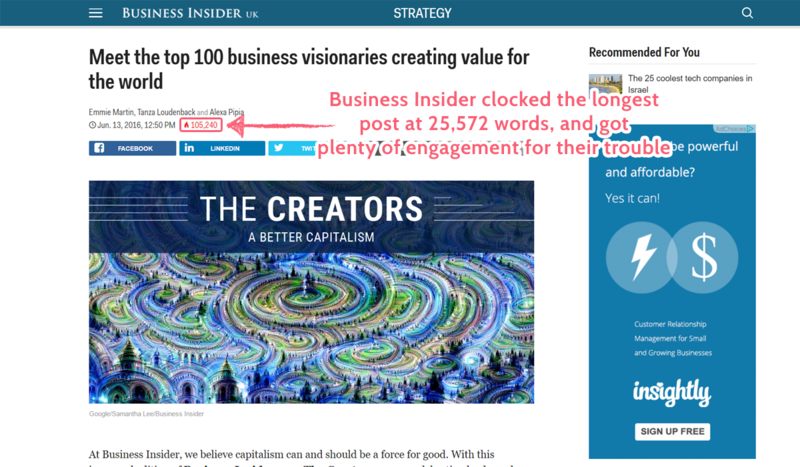 First off, if you just want to get a small chunk of shares, it’s possible to do that without creating great content. Again, I can’t say the precise tactics used to promote these pieces, but I highly doubt anyone would share them for their own merits. Having said that, each of these articles only got around 20k Facebook engagements (remember, these aren’t shares alone) and practically nothing else, so even spam tactics will only get you so far. Second, if you do attempt shadier tactics to promote bad content, you’re pretty much ruining your chance of getting serious engagement or really anything beyond that which you generate yourself. Again, if your content isn’t good quality then no-one will be sharing it on other channels, meaning that practically the only interaction you get will be that which you pay for. If you don’t already have an audience to give you the boost you need to get your content noticed, one of the best ways is to utilize someone else’s by interviewing them. Not only are you taking advantage of their expertise on a topic to create useful content which you (probably) wouldn’t be able to make otherwise, but upon publishing their audience is likely to share and interact with the post. Of the most shared articles with a domain rating of 10 or less, the only actual article (aside from spam, dead links, and Diply stories) is this post from Behind the Business – a tiny website with three blog posts, two organic keywords, and no traffic. This confused me, so I did a little digging. 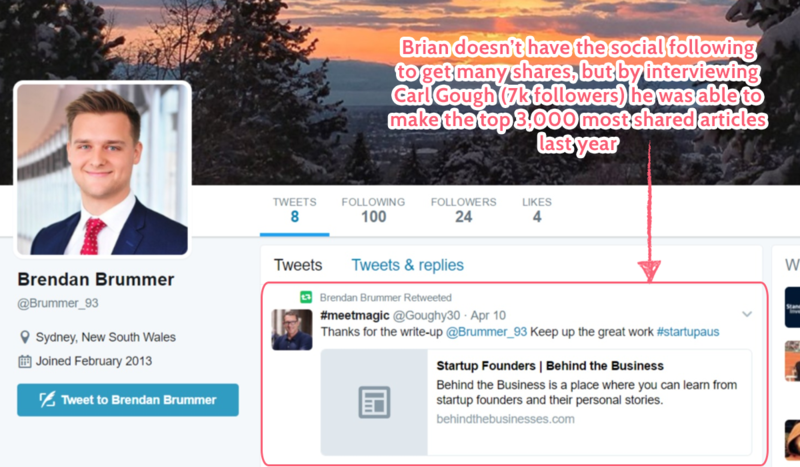 Brendan Brummer (the author of the site’s three posts and assumedly the site owner) has only 24 Twitter followers, and the website itself is followed by 194 people on Facebook – nowhere near enough to warrant the share count. However, the guest of the article (Carl Gough) has more than 7,000 Twitter followers. Just by interviewing Carl, Brendan was able to take advantage of a much larger audience than his own, and give the article the visibility it needed to become one of the most shared posts in the past year. Mike Dillard‘s website is another example, albeit from a slightly more established setting. With a domain rating of 50 it wouldn’t be surprising to see in the top 3,000 most shared articles, but Dillard managed to get four separate pages onto the list. Each and every one was a short summary post to accompany an episode of his Self Made Man podcast, and thus benefitted from both his own audience and that of his guest. If you’re thinking about attempting a viral marketing campaign you need to take a second to wonder whether it’s the right thing to do. Sure, you can get huge amounts of exposure for your brand and product (if you manage to pull it off), but more views doesn’t always equal better business. Remember the link (or lack thereof) showed earlier between the number of shares on social media and its organic traffic. An instant boost in viewership is all well and good, but it’s not a reliable model to build your business on. If your aim is to consistently get readers onto your site you need to take the longer road and come up with an effective SEO strategy. This will also probably benefit sales of any products you’re trying to push, since you can target keywords to attract a more relevant audience than if you wrote a highly popular but generic article. Here’s to the trends found from these articles fueling your own viral marketing campaigns and inspiring your own research into how and when to go viral. Have any tips of your own for viral marketing? When do you think it’s best to go for shares over organic traffic? I’d love to hear from you in the comments. Useful! Analyzing the niche and the content that worked fine is the key of having your own viral idea. Sometimes is just the crowd that makes an article or product viral. Indeed it is Bailey, and great to see you in the comments (as always). I think you’ve also got to think about what your ultimate goal (and audience) is though too – even if you manage to get a piece of content to go viral, if the ultimate goal is to push signups then the effort might’ve been better spent producing a highly targeted piece.